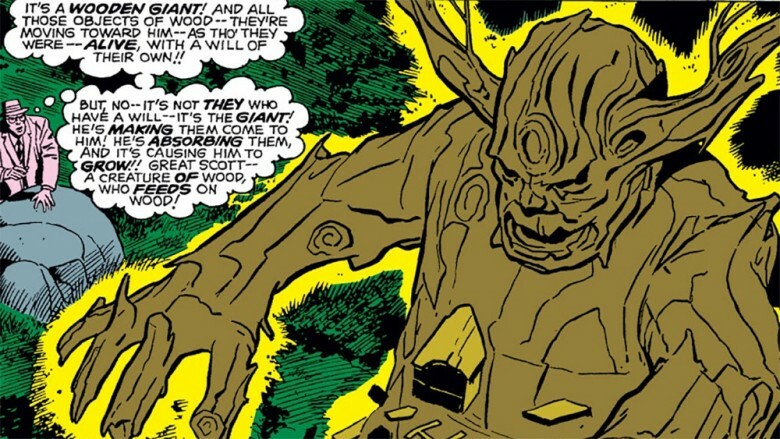 Before Groot was the gentle giant fans know and love today, he was a monster. Literally. A 125-foot-tall, rampaging alien monster. He stayed that way for 45 years, too, until a sudden and unexpected face-turn transformed him into a hero and paved the way for his membership in the Guardians of the Galaxy. It was 1960, about a year before the Fantastic Four made their cosmic-powered debut, and about a year and a half before the Hulk burst onto the scene. Marvel Comics as we know it today didn't exist—for the most part, the company (which was known as Atlas) published horror, comedy, and romance comics. But Groot was there. In Tales to Astonish #13, Stan Lee and Jack Kirby published a story called "Groot! The Monster from Planet X," in which a tree-like beast crashes to Earth and attempts to kidnap the population of an entire city, hoping to take his prisoners back to his home world for nefarious experiments. Normally, in the Marvel Universe, that wouldn't be a problem—the Avengers or some other team would show up and make quick work out of the invader—but superheroes don't exist in this world yet, and the villagers have to fend for themselves. Unfortunately for them, Groot isn't any normal alien—in this story, he calls himself the "overlord of all the timber in the galaxy" and gets stronger by absorbing wood—and traditional weapons just make him angry. This isn't the cute and cuddly tree-beast that fans have come to know and love, either. Not only can Groot talk, but he towers above the villagers like a Godzilla villain, destroying everything in his path. Groot brings the local forest to life and begins rounding up his human subjects, when one lowly scientist discovers Groot's only weakness: termites. As the insects chomp away at Groot's wooden body, the creature withers and dies, leaving Earth safe—for now. The next time the Monster from Planet X appears is in The Incredible Hulk Annual #5, in which a recurring Marvel villain named Xemnu resurrects Groot and a handful of other villains from Marvel's old horror comics and pits them against Bruce Banner's alter-ego. After smashing his way through a fifth-dimensional demon named Diablo and a mud monster called Taboo, Groot takes his shot at the Jade Giant. At first, things go well. 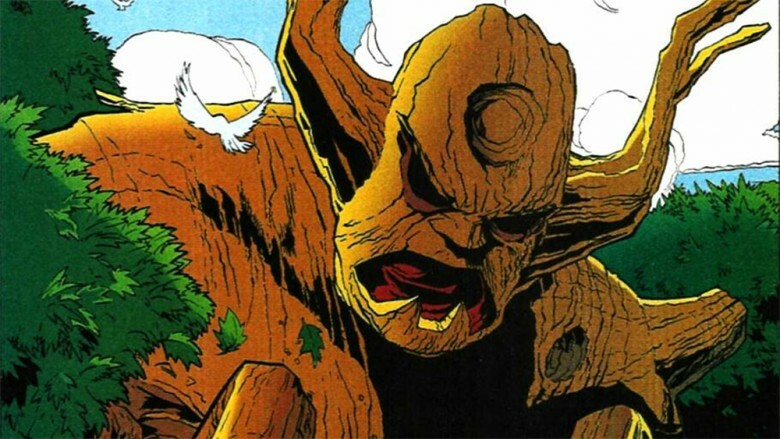 Groot's branches nearly choke the life out of the Hulk, while planting his roots in the ground makes Groot impervious to the Hulk's gamma-powered punches. Groot even whips out a new skill—a wave of razor-sharp thorns—which seem all set to finish the Hulk off for good. But all of these attacks make Hulk angry, and you know how that tends to end up. 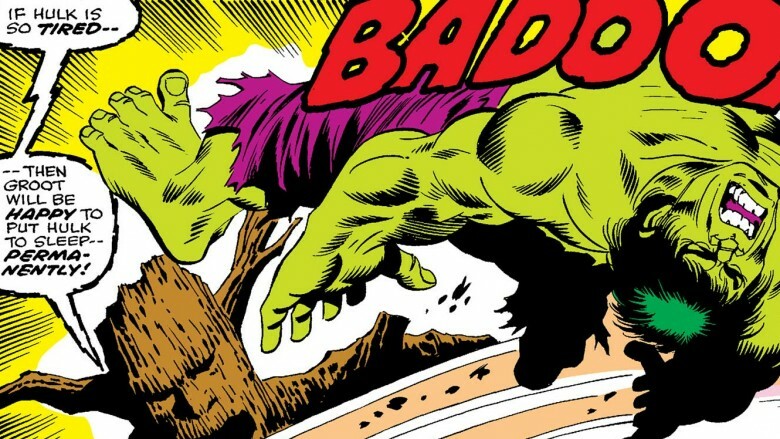 Hulk blocks Groot's attacks with a stone, which he proceeds to use to beat Groot into a stump. That's not the end of Hulk's travails—before the adventure ends, Hulk has to fight off Goom, the electric-powered Zzzax, and Xenmu himself—but it is the end of Groot's role in that story. After his showdown with the Hulk, Groot sat out most of the '80s and '90s before his big return (c'mon, this is comics—did you really think he'd stay dead? ), but he did make one appearance in 1997's The Sensational Spider-Man Minus 1. In the story, a pre-spider bite Peter Parker stays up late reading Atlas' old horror comics—and then, when he goes on a fishing trip with Uncle Ben, learns that all of those classic stories have come true! Except, not really—naturally, it's all just a bad dream—but before Peter realizes that, Groot puts Peter and Ben through the wringer. 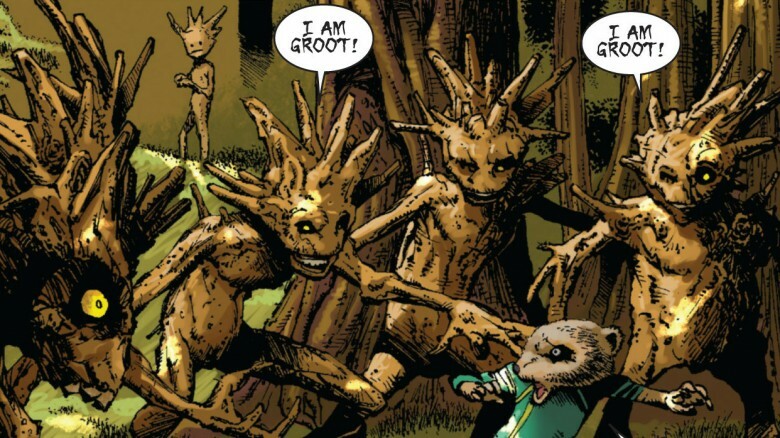 While fleeing from the plant-like Gigantus, the Parker boys run right into Groot, who announces his presence with his classic catchphrase and proceeds to chase Peter and Ben right into a dead end. That would've been the end of them, too, if the savage Vandoom hadn't appeared and smashed Groot into splinters. As it turns out, the only thing that Marvel's classic horror villains hate more than humans are other monsters, and it's not long before Ben is captured and the entire forest is leveled by the giant brawl. That's when Peter wakes up and realizes there are no casualties—aside from Peter's comic book collection, which Ben and May promptly confiscate, forcing Peter to read real books (shudder) until he's a little bit older. Groot is a hard guy to put down—remember, he's grown back from a twig more than once—and it's going to take more than the Hulk to take him out for good. In Marvel Monsters: Monsters on the Prowl, readers learn that, at some point in the past, the Collector rounded up Groot and all of Marvel's other classic monsters and locked them away in an underground prison. That's weird and vaguely sinister, but relatively safe, at least until the Fantastic Four villain Mole Man attacks and busts the prison wide open, freeing Groot and all the other prisoners. The army of monsters make their way from Canada to New York, where they start stomping everything in sight. 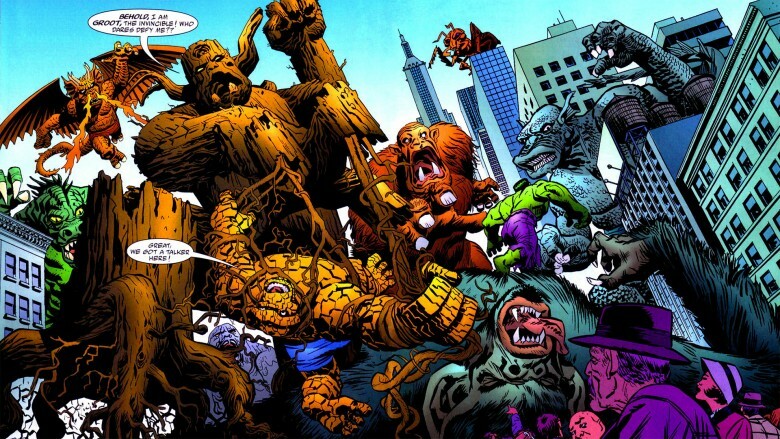 Unfortunately for them, Marvel's "good" monsters—the Thing, the Hulk, Giant-Man, and the X-Men's Beast—are on the scene. 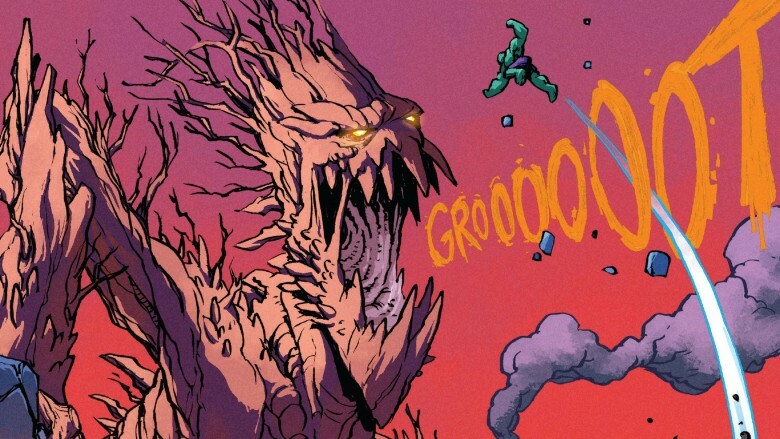 Most of the monsters are easy pickings for the experienced superheroes, but Groot puts up a bit more of a fight. Groot uses his branches to choke the Thing, and later tries to escape while tangling the Thing and Hulk in his roots, but ultimately, he's defeated by the team of heroes and locked away—although, obviously, not for good. Groot's road to redemption begins in the Nick Fury's Howling Commandos mini-series, but not before the alien gets in a few more licks at the good guys' expense. Under the leadership of S.H.I.E.L.D. agent Clay Quartermain, the Howling Commandos are a band of monsters (yes, that "howling" is meant to be taken literally) charged with hunting and capturing other monsters—and Groot is one of their very first victims. In Nick Fury's Howling Commandos #2, Quartermain and his team find Groot hiding in a large forest, and proceed to use every piece of weaponry at their disposal to remove him from the playing field. As you can imagine, that's quite a task. As the S.H.I.E.L.D. agents plaster Groot with sonic weapons, the Monster from Planet X lashes out in pain and rage, nearly decimating the team. Thankfully, It the Living Colossus is able to subdue Groot before anyone gets hurt, and the tree monster is quickly taken captive and locked away. Groot's prison term is short-lived. The evil wizard Merlin sends an army of goblins and other supernatural creatures to attack Area 13, the Howling Commando's home base, and in Nick Fury's Howling Commandos #5, Quartermain opens the prison doors and frees Groot and the other prisoners, causing a stampede that turns the tide of the battle. While the other monsters flee, however, Groot stays behind and offers the Howling Commandos his help. Traveling on Groot's back, the Howling Commandos take the fight to Merlin's stronghold and put the wizard in his place—and give Groot the redemption that he desperately craves. Here's the big twist: despite a very clear and well-thought out character arc, the Groot who joined the Guardians of the Galaxy might not be the same one who terrorized the Marvel Universe for 50 years. See, as you know, Groot's native language contains only a single phrase: "I am Groot." 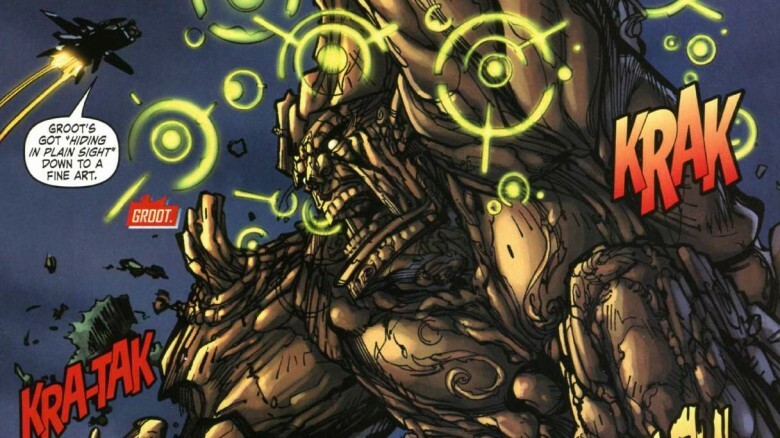 By extension, that means that everyone on Planet X, Groot's homeworld, is also named Groot. That theory is confirmed in Guardians of the Galaxy #14, which features a backup story exploring Groot's origin. Before he left home to become a superhero (or, possibly, a world-conquering menace), Groot lived peacefully on Planet X, where a group of squirrel-like "maintenance mammals" keep the forests in tip-top shape. One day, some young saplings decide to assert their authority and harass the small critters, and that's when the trouble starts. A little bit into the Groots' rampage, another young Groot—presumably, our Groot—intervenes, saving the little creatures' lives. This doesn't make the other Groots too happy. As the maintenance mammals thank the heroic Groot for his interference, the other Groots attack again. Enraged, good-Groot tears his peers into pieces. The ruling Groots catch wind of this and force now-murderer Groot to leave Planet X in exile. 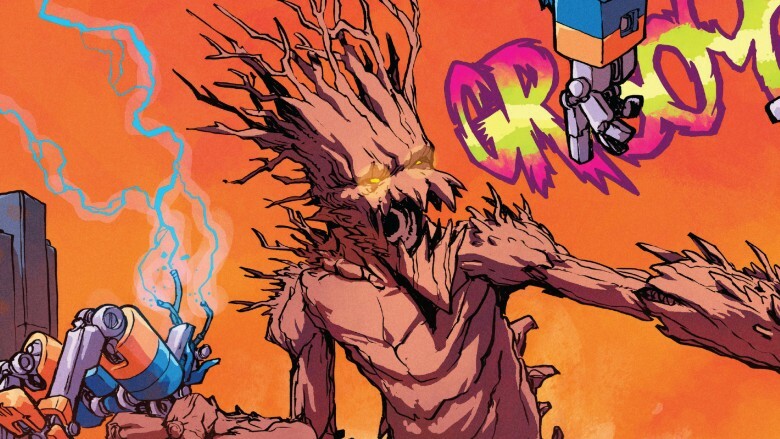 Depending on how you look at it, Groot is either a bully, a murderer, or both—so, in a way, it doesn't matter if he's the same Groot who debuted back in Tales to Astonish #13. He's damaged goods no matter what. Technically, this isn't something terrible that Groot has done—it's something that he will do, according to an elaborate virtual-reality simulation. When Skottie Young and Jake Parker's Rocket Raccoon #9 flashes forward to 2046, Groot returns to his original, kaiju-esque size and plows through New York. He also plows through the Hulk, who ends up little more than a snack for the rampaging monster. As Iron Man explains, the Avengers tried to use Groot's regeneration powers to cure diseases—like, all of 'em—but the process backfired, turning Groot into a giant, mindless beast. The only creature in the universe who can stop him? Why, Rocket Raccoon, of course. Tony Stark tracks Rocket to Knowhere, the spaceport built inside the skull of a dead celestial, and tries to enlist his help, but Rocket is old and bitter and wants nothing to do with Iron Man or any of Earth's heroes. Meanwhile, the rampaging Groot tears S.H.I.E.L.D. 's helicarrier in half, sending Steve Rogers plummeting to his death. Iron Man soon follows, smooshed under Groot's wooden fist. Rocket finally arrives, half-drunk, and transforms his ship into a giant mech to fight Groot hand-to-branch, but it's no match for Groot's raw strength, and Groot tears both the robot and his friend to pieces. Still, it's not all in vain. Rocket's sacrifice snaps Groot back to his senses and transforms the monster into a giant, life-giving tree, while Rocket goes down in history as one of the world's most important heroes. You don't need much context to know that the giant red button featured in Guardians of the Galaxy Vol. 2's second trailer is bad news. For one, it's a giant red button attached to a countdown clock. That's never good. More directly, however, Rocket flat-out says that pushing the button will kill everyone—he even calls it "the death button"—while Star-Lord lets it slip that the button is, as you can probably guess, attached to an atomic bomb. So, yeah, probably not a good thing to mess around with, right? But that doesn't stop Baby Groot. In fact, he's practically giddy about pushing that button. Ultimately, Rocket stops Groot from pushing the button, but isn't fast enough to stop the little sapling from running away with the device when his back is turned—and if we didn't know for a fact that the Guardians will be appearing in Avengers: Infinity War, we'd say that's probably it. Farewell, Guardians. We barely knew you.